ATLANTA (AP) — A healthy wrist helped Dansby Swanson keep up his resurgence that has added more punch to Atlanta’s lineup. Swanson hit a game-ending single against a five-man infield and the Braves, helped by a catcher’s interference call, beat the Miami Marlins 4-3 on Sunday. “I love that weight, so to speak, on my shoulders,” Swanson said. After Swanson hit only .238 in 2018, he had offseason surgery to have a troublesome loose body removed from his left wrist. Swanson was upbeat all spring, expressing optimism about his newly empowered swing. So far, he has backed up his big hopes. His fourth-inning homer was his team-leading third of the season, and his nine RBI also lead the team. Miami’s Curtis Granderson tied it in the top of the ninth with a pinch-hit homer off Arodys Vizcaíno (1-0). Freddie Freeman led off Atlanta’s ninth win an infield single, the ball glancing off pitcher Adam Conley’s glove as he tried to snare the grounder behind his back. Ronald Acuña Jr. followed with an apparent double-play grounder, but home plate umpire Will Little immediately called catcher’s interference on Chad Wallach. “Inside pitch, I was a little too close and it hit my glove,” said Wallach of Acuña’s bat. Marlins manager Don Mattingly was upset Acuña wasn’t called for a strike on his check swing before the catcher’s interference. First base umpire Joe West said Acuña checked his swing. A passed ball by Wallach allowed Freeman to advance to third. After Mattingly brought in right fielder Rosell Herrera to form a five-man infield, leaving right field vacant, Conley (0-2) walked Markakis to load the bases. Swanson lined the game-winning single to left field, and then high-stepped his way to first base as his teammates surged out of the dugout in a race to surround him for an on-field celebration. Swanson, hitting .346, has added more depth to an Atlanta lineup also strengthened by the addition of Josh Donaldson. “It’s a tough lineup to go through,” Mattingly said. Freeman hit a two-run homer off Caleb Smith in the first inning. Sean Newcomb gave up two runs in seven innings in a possibly important start to protect his place in Atlanta’s rotation. The left-hander overcame second-inning control problems to allow only four hits. Ozzie Albies led off the Atlanta first with a single and scored on Freeman’s first homer. Newcomb gave up his only two walks in the second, including a bases-loaded pass to Miguel Rojas. Smith’s single off Newcomb’s glove drove in Starlin Castro, who doubled. Marlins: RHP Sergio Romo was available after being hit by a line drive on the bottom of his left hand Saturday night. Braves: C Brian McCann was placed on the 10-day IL with a right hamstring strain. The catcher position became a concern when McCann’s replacement Saturday night, Tyler Flowers, was hit by a pitch on his right hand. X-rays were negative Saturday night, but there was ongoing concern and Flowers was scheduled for further tests Sunday. A 14-5 record against Miami last season helped the Braves win the NL East. They’re off to a good start this year, winning two of three in the series. 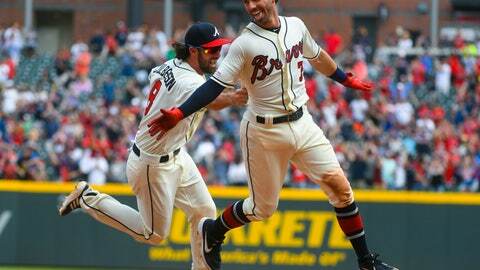 The Braves are 5-1 since being swept at Philadelphia to open the season. Braves catcher Alex Jackson, recalled from Triple-A Gwinnett before the game, was 0 for 3 in his major league debut but earned compliments for his work with Newcomb. Marlins: Following an off day on Monday, Miami opens a three-game series at Cincinnati on Tuesday night when RHP Jose Urena (0-2, 10.38) tries to bounce back from two losses to open the season. Urena was 4-0 with a 2.23 ERA in his final six road starts of 2018. Braves: RHP Julio Teheran, who has a 2.96 ERA in four career starts at Coors Field, will start when the Braves open a three-game series at Colorado on Monday night.